The year is almost over, which gets many people thinking about New Year's resolutions. Perhaps you are recalling the resolutions you made at the beginning of this year and getting down on yourself for not saving more money and paying off more debt. "Next year," you promise yourself. 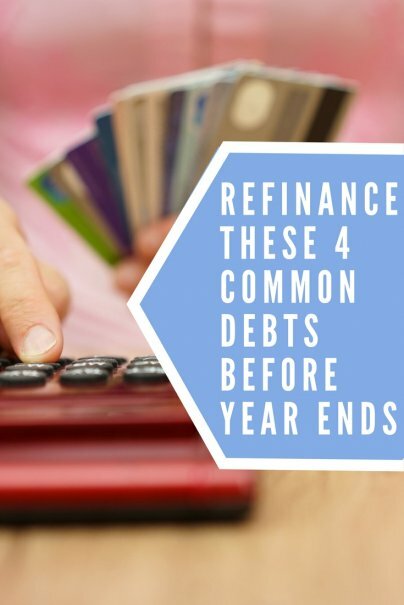 But if you refinance these four loans, you can get a head start on your financial goals and even sail into the New Year with a little less financial burden on your shoulders. Here are the top loans you should refinance, as well as a few tips to decrease your debt burden altogether. Does your credit card debt seem like it never goes down, even when you throw extra money at it each month? It's the interest rate. There are two ways that you can refinance your credit card balance and save money each month. The first is to refinance your debt with a low interest personal loan, like one through SoFi or Prosper. This works well for individuals that have high interest credit card debt. A low-interest personal loan will allow you to pay off your credit card debt faster, but be aware that your monthly payments will be higher. This is because credit cards only require a minimum payment each month, which can be very low, depending on the debt. Keep in mind, however, that those low monthly minimum payments are what keep you in debt for so long. Therefore, when you switch the debt to a three- or five-year personal loan, you will be required to pay more each month. Another popular way to refinance credit card debt is to transfer it to a promotional 0% balance transfer card. This will allow you to transfer your debt to a card that does not charge interest for the promotional period. To use this transfer to your advantage, divide the amount of debt you have by the number of promotional interest free months offered. For example, if you are transferring $10,000 of debt on a card that offers 15 months of 0% interest, then be prepared to pay about $667 each month to avoid interest charges at the end of the promotion. Do not use this card to accumulate new debt. Mortgage rates remain historically low, but recent news shows that rates are slowly rising. If you are still battling with a mortgage rate higher than 5% or are paying PMI, now is the time to refinance. Refinancing your mortgage can extend the life of your home loan, but it can also save you dramatically each year, especially if you are paying pesky PMI fees. Research the cost to benefit ratio, knowing how much money you will save each month. Also research to know if a 15-year mortgage makes financial sense. In many cases, switching to a 15-year loan is riskier for your budget, but other times it can be a small monthly increase that will pay off big time in reduced interest payments. Americans owe a lot on their car loans. USA Today reports, "The total balance of all outstanding auto loans reached $1.027 trillion between April 1 and June 30." If you secured your auto loan through a dealer, there is a good chance you are overpaying for your car loan. Contact your local credit union for rates, and don't forget to research online for the best rates. I have used two credit unions in the past to successfully secure an auto loan for less than 2.50%, and those credit unions did not have an actual building within 100 miles of me. The burden of student loan debt is crippling millions of Americans. You don't need to live with your student loan forever. As long as you have good credit and are not in default with your loans, you have options. If you have federal student loans, then I strongly recommend looking into the forgiveness programs available. It might mean taking a less than desirable job for a few years, but if that job forgives a large portion of your student debt, then it could be worth more to you than a higher paying job. Other options include income-sensitive repayment programs, such as PAYE and IBR, which peg your monthly payments to your income level. Thus, if you're struggling to make a standard monthly payment, these programs set your monthly outlays at a more affordable level. If you are not eligible (or a fan) of the forgiveness programs, refinancing your student loans is your next best option. Note that if you refinance your loans, you will be switching them over to a private lender. This means that if you have federal student loans, you will no longer be protected for federal loan repayment programs if you suddenly lose your job or face financial hardships. Refinancing these common debts can help you pay less each month, as well as less overall. Use these refinancing strategies to get out of debt faster and take control of your finances.